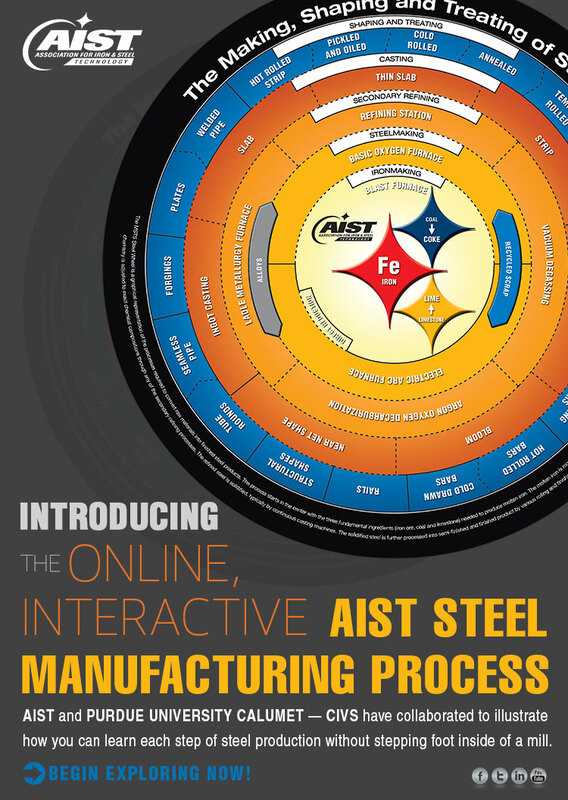 The Association for Iron & Steel Technology (AIST)A�released a press release describing their collaboration with CIVS on the creation of the Making, Shaping and Treating of SteelA� Wheel. The Steel Wheel is a graphical representation of the processes required to convert raw materials into finished steel products. The 3D visualizations on the wheel include detailed models equipment and animations to show the functions and sequence of each process. A variety of processes is included from throughout the steel industry and includes Ironmaking, Steelmaking, Secondary Refining, Casting, Shaping and Treating. The interactive Steel Wheel provides a reference for the public and steel professionals alike to learn about the spectrum of processes, facilities, and equipment used across the industry.